Danny Cipriani has been banned for three weeks following his sending off in Gloucester's Heineken Champions Cup game against Munster. The Gloucester and England international fly-half appeared before an independent disciplinary committee in Paris on Wednesday after being dismissed for a dangerous tackle on Munster centre Rory Scannell last weekend. Tournament organisers European Professional Club Rugby said that Cipriani can play again on November 12. 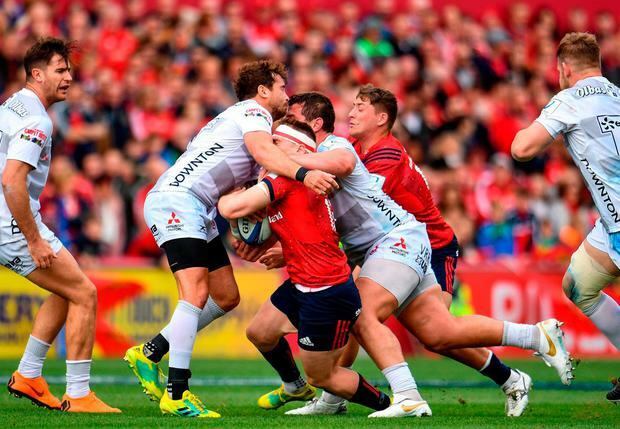 It will rule him out of Gloucester's games in the new Premiership Cup competition against his former club Wasps on Saturday, then Bristol and Northampton. But he will be available when the Gallagher Premiership resumes, with Gloucester hosting Leicester on November 16. Cipriani was not selected in England's autumn Test squad, being overlooked by head coach Eddie Jones for Twickenham appointments with South Africa, world champions New Zealand, Japan and Australia next month. Were Cipriani to be required by Jones for potentially an injury-related call-up, though, he would be available for the Japan and South Africa fixtures. In a statement, EPCR said: "An independent disciplinary committee consisting of Philippe Cavaleiros (France), Chair, Martyn Wood (England) and Frank Hadden (Scotland), heard evidence and submissions from Cipriani, who accepted the red card decision, from the Gloucester rugby director of rugby, David Humphreys, and from the EPCR disciplinary officer Liam McTiernan. "The committee upheld the red card decision and found that the act of foul play was at the mid-range of World Rugby's sanctions and selected six weeks as the appropriate entry point. "There were no aggravating factors, and due to the player's clear disciplinary record and his timely expression of remorse, the committee decided to reduce the sanction by the maximum allowable of 50 per cent before imposing a three-week suspension. "Cipriani is free to play on Monday, 12 November 2018. Both he and EPCR have the right to appeal the decision." It has been a roller-coaster year for Cipriani. He returned to England's line-up on their South Africa tour in June, making his first international start for 10 years. He was then charged by the Rugby Football Union with "conduct prejudicial to the interest of the game," which was upheld following a lengthy hearing in Bristol, but he avoided further sanction.